By: Wu Piao?, Yu Xing? 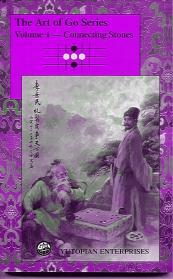 The Art of Connecting Stones is volume one of the The Art of Go Series from Yutopian. An advanced problem book which contains a large selection of tactical problems on connecting and allied topics. There are times for people of various grades completing this book at the Problem Book Grades page. ilan: This is definitely an example of what a good problem book should be (compare with Liping Huang's Problem Series, Volume 1), with challenging, interesting, and correct problems, with detailed solutions which are actually well written, e.g., "White plays at 1 before attaching underneath at 3. The sequence is excellent." Maybe one of the reasons I like this book is that it is exactly at my present "physiological" limit, which means that I can do the problems in reasonable time (within the time frame of an actual go game) with an extreme effort. In this sense, it appears to be easier than the difficult problems in Get Strong At Life And Death, though I should say that I have always found capturing race and connection problems easier than life and death problems (e.g., when the these problems are given the same difficulty rating). In any case, I believe that the problems should be classified as fairly hard (I am 4K now, for whatever that's worth). I definitely would not recommend this book to someone rated much lower than that, as I tried this book about a year ago, and looking over the same problems now, I realise that all that pain and effort what wasted. So, if you are not ready for this difficulty level, I would recommend the book Rescue and Capture which is much easier but which covers the same type of problem. This problem book seems very useful, because in an actual game, the big middle game fights involve just as much tactics about breaking out and connecting as they do life and death. So this is good practice for the former. In fact, it should give me a different feeling for what is connected, because most of the problems in the book look completely impossible at first glance. 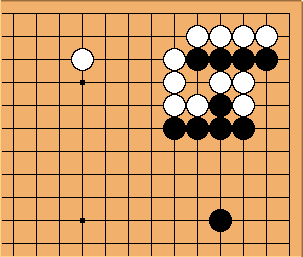 I should say that I haven't really seen such subtle connection techniques in games I've observed even among 5 dans, but in any case, working the problems out should help reading and ability to connect by being more aware of such tactics. But I should also add that the problems are interesting in themselves as some have very surprising solutions which are enjoyable. Problem books are not just about becoming stronger. 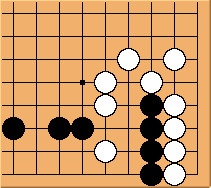 One interesting point is that in the initial problems of the book, the side that has to save his stones has many liberties, which is necessary for the tactics leading to the connection. However, as you get on in the book, this is no longer true, and a lot of the problems require a thorough understanding of capturing races and the tricks involved in winning them. So you're not going to get much out of this book unless you've mastered those. Find the solution at /Solutions. Find the solutions at /Solutions.